External Affairs Minister Sushma Swaraj on Monday met several foreign dignitaries from Bangladesh, Japan and Sri Lanka in an effort to strengthen strategic partnership and bilateral relations with these countries. Swaraj met Sri Lankan Prime Minister Ranil Wickremesinghe, Japan's State Minister for Foreign Affairs, Kazuyuki Nakane and Bangladeshi Planning Minister AHM Mustafa Kamal and held talks with them on the sidelines of the third Indian Ocean Conference. Inaugurating the third Indian Ocean conference in Hanoi, Swaraj said that the Indian Ocean is a central component of a free and fair Indo-Pacific region, adding that the country has a vision of collective action and cooperation for realising its true potential. "The Indian Ocean was known as 'Ratnakali' or ocean of treasures'. Our vision of the region is of collective cooperation and coordination. Therefore, nurturing a climate of peace and stability is an important priority for our foreign policy. We have to commit to the idea of peaceful co-existence," she had added. Earlier in the day, Swaraj had also hailed the Indian embassies across the world for their efforts. 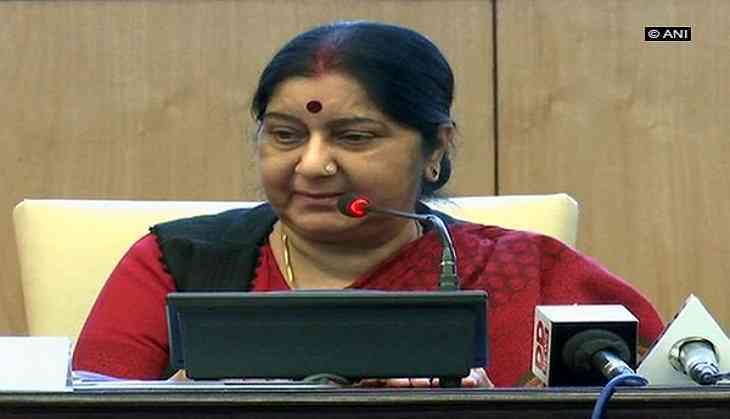 Speaking at the Swami Vivekanand Cultural Centre in Hanoi, Swaraj had said, "If any Non-Resident Indian (NRI) gets stuck anywhere in the world, they are confident that their government will save them. Relief is just one tweet away. What was never a priority in embassies has become the top priority now." She had also unveiled the bust of Mahatma Gandhi at the Indian embassy in Hanoi. Ministry of External Affairs spokesperson Raveesh Kumar tweeted, "Paying respect to the Father of the Nation! EAM @SushmaSwaraj unveiled the bust of Mahatma Gandhi in the Chancery building at the Embassy of India in Hanoi." Swaraj is on a five-day, two-nation tour to Vietnam and Cambodia since August 26 to strengthen bilateral ties with these two countries.